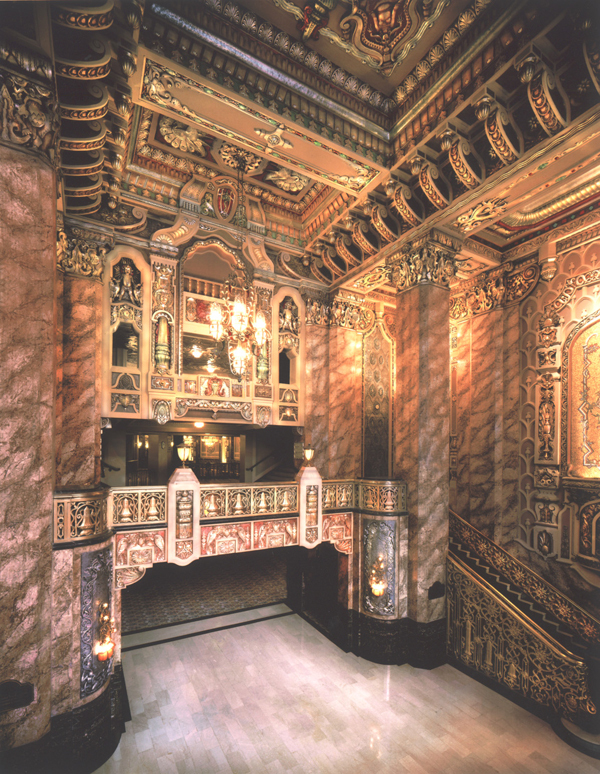 As one of the first motion picture palaces whose décor was inspired by the Far East, Chicago's Oriental Theatre opened to much fanfare on May 8, 1926. Also, designed by George L. and Cornelius W. Rapp for theater managers Balaban and Katz, the theatre, a virtual museum of Asian art, presented popular first-run motion pictures, complemented by lavish stage shows. Turbaned ushers led patrons from the lobby, with polychrome figures and large mosaics of an Indian prince and princess, through an inner foyer with elephant-throne chairs and multicolored glazed Buddhas, to the auditorium's "hasheesh-dream décor." Among the many stars that played the theatre are Paul Ash (billed as "the Rajah of Jazz"), The Three Stooges, Judy Garland, Al Jolson, Stepin Fetchit, Sophie Tucker, George Burns and Gracie Allen, Cab Calloway, Duke Ellington, Fanny Brice, Danny Kaye and Alice Faye. During a record-breaking week in 1930, as many as 124,985 patrons visited the Oriental to see the hit film "Flight." Although management changed hands several times in the subsequent decades, the theatre continued to feature films until the early 1970s, at which time the M&R Amusement Company briefly presented live performances by such artists as Stevie Wonder, Gladys Knight and the Pips and Little Richard. Soon the theater fell into disrepair. In an effort to preserve the theatre, it was added to the Federal National Registry of Historic Places in 1978, but the building continued to crumble. The theatre was closed to the public in 1981, and the site was considered for a two-story, 50,000 square-foot shopping mall and a 1,600 seat cinema. In 1996, Chicago Mayor Richard M. Daley announced that the Oriental would be restored to its original grandeur for the presentation of live stage musicals by Livent, Inc. Renamed Ford Center for the Performing Arts in 1997, the restoration of the theatre was completed in October 1998, at which time it was opened with the Chicago premiere of Ragtime. The venue was acquired by SFX Theatrical Group in 1999, and its production of Fosse debuted at the Ford Center before embarking on a national tour. Broadway In Chicago, formed in 2000, began to light the stage with the record-breaking run of Wicked for three and a half years and the long-run production of Billy Elliott, along with many Pre-Broadway World Premieres including: The Addams Family, Big Fish, On Your Feet!, The SpongeBob Musical, Escape to Margaritaville, Pretty Woman: the Musical, and The Cher Show with many more to come. In February 2019, the theatre was renamed the James M. Nederlander Theatre, in honor of the legendary Broadway theatre owner and producer and patriarch of Broadway James M. Nederlander. As the founder of Broadway In Chicago, he championed theatre in Chicago having presented shows here for over six decades.